William completed a Bachelor of Music Degree with 1st class honours at the Elder Conservatorium in Adelaide, Australia followed by the Advanced Performance Programme at the Australian National Academy of Music and a Diplom at the Hochschule für Musik Köln in Germany. 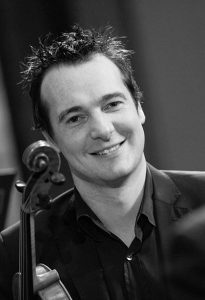 He has performed in several of Australia’s leading orchestras including the Adelaide, Melbourne and Sydney Symphony Orchestras. William has been a permanent member of the Tasmanian Symphony Orchestra since 2007. William has been broadcast in recital several times on ABC Classic FM and has tutored for youth orchestras in Adelaide, Hobart and for the Australian Youth Orchestra Young Symphonists Programme. William has been a guest soloist with the Nelson Symphony Orchestra in New Zealand. As a chamber musician William has performed throughout Australia and Europe and has collaborated with artists as diverse as Katie Noonan and Deborah Cheetham to Tommy Emmanuel and Neil Gaiman. William is the violist of the Kettering Piano Quartet and has been the director of the Derwent Strings, a community training orchestra in Hobart, since 2014.